Statistically, about half of motorcycle crashes are single vehicle and the other half are collisions. Single vehicle means a rider crashed without involving another motorist. Collisions mean the motorcycle crashed into another vehicle. To survive urban traffic, we need to be skillful at controlling the bike and also proficient at avoiding collisions. Riders who collide with other vehicles typically report a very short time between the point where they realized a crash was about to happen and the actual impact�perhaps two seconds or less. That might lead you to believe that there just isn't time to take any evasive action. But the truth is that collisions seldom occur as suddenly as most crashees think. Now, if you suddenly realize that you are on a collision course with a taxicab just a second away from impact, the rest of the crash may seem awfully quick. But the "suddenness" is often a matter of not observing what is happening until too late in the process. If you know where to look, how to look and what to look for, you can almost always spot a potential collision well before the point of impact. And once you understand what is happening, you can just make a little correction to avoid riding into the problem. One of the reasons why cities are so hazardous is the amount of stuff going on all at once. We've got multiple lanes of traffic, vehicles weaving around in all directions and millions of traffic signs and signals. Whatever is out there demands your attention at once, and any one problem is capable of causing you grief. The paradox is that you've somehow got to be aware of all the hazards at once, but there are often too many hazards to keep track of at any one moment. How do you deal with all that's happening around you? The farther ahead you spot trouble, the more time you will have to deal with it. 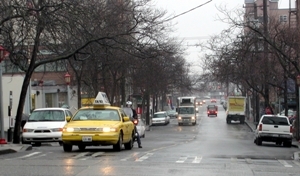 The safety experts often use the yardstick "12 seconds" when describing how far ahead to look. That's the distance you will be covering during the next 12 seconds, which translates into about as far ahead as you can see any details. Looking ahead farther gives you more time to react to what you see. Yes, you should be watching the cars immediately ahead, but you should also be observing what's happening at the intersection and beyond. Looking 12 seconds ahead is a good habit, but you need to be a good observer. You need to not only keep your eyes moving to take in as much as possible, you need to make some judgment calls about what's happening. You need to be aware of everything, but you can prioritize what you see, and focus momentarily on those things which are in the process of becoming potential hazards. Intersections are danger zones where you especially need to focus your attention. Folks with poor judgment are very likely to make mistakes at intersections, pulling out in front of other drivers, making quick turns, jamming on the brakes or motoring through red lights. 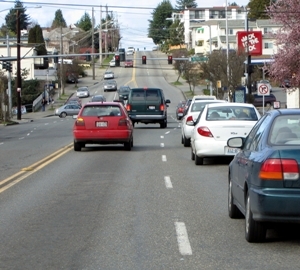 Recognize that "intersections" include anywhere vehicles can cross paths, whether on divided eight-lane arterials or where two lanes cross in the shopping mall parking lot. "Intersections" are danger zones because vehicles cross paths. The motorcyclist behind the taxi may be able to see ahead, but an oncoming driver might not observe the motorcycle. One important tactic is to "separate" the hazards. Although it may seem as if everything is demanding your attention at once, it is possible to separate your awareness of the hazards, if only by a few feet or a few milliseconds. For example, the big rattling car transporter rolling along in the next lane may scream for attention, but one or two glances may confirm that it's not really a problem. 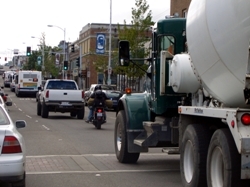 By comparison, that oncoming SUV approaching the intersection ahead may not be demanding attention, but if you know that left-turners are a frequent hazard for motorcyclists, you'll focus on that SUV, not on the noisy truck. Just as you can mentally separate your observations of what is happening around you, you can physically separate yourself from hazards. You can move the motorcycle farther away from a bad situation, and you can separate one hazard from another by changing lane position or speed. For example, if that rattling car transporter is too much of a distraction being so close, you can speed up, slow down, or change lanes to get farther away. Likewise, you can move away from a slow-moving car that's in the process of collecting a gaggle of trouble around it, or change lanes to move farther away from a car that's poking its nose out of an alley. Since intersections are trouble enough, I try to separate myself from other hazards before I get to an intersection. 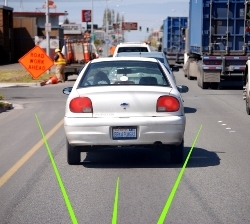 If I am being tailgated by an aggressive driver, or paced by someone in an adjacent lane, I take steps to move farther away. If at all possible, I move away from trucks or busses, primarily because they block the view. I'd rather not allow myself to be a victim of whatever happens, and I prefer not to let the hazards multiply. I suggest you do the same. Take control of the situation to continuously improve the odds in your favor. Don't be squeezed into a corner or boxed into a trap if you can help it. Don't let yourself be squeezed into a corner. 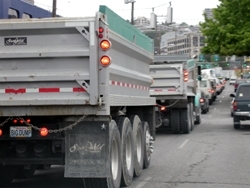 Move away from view-blocking trucks or busses. Back at the beginning, I suggested that the wise rider could learn to make simple adjustments to avoid riding into trouble. OK, you can learn to avoid almost all crashes, but once in a while something happens that you had no way of seeing or predicting. For example, a large rock suddenly tumbles down onto the road just as you come around a corner, or a black horse escapes his corral on a rainy night and stands in the middle of the road. When you suddenly realize you're two seconds from impact, you'll need to take some immediate evasive action. It would be comforting to think that you could practice emergency maneuvers such as sudden swerves or quick stops and be able to do them successfully when needed. But humans are "wired" so that when we are faced with emergencies we tend to react based on habits and think about it later. If you're in the habit of using the front brake to the limits of traction, in a crisis you'll squeeze the brake lever without thinking about it. If you're in the habit of pushing on the grips to quickly lean the bike, you'll do a quick swerve without wasting any time. When the chips are down, you'll do whatever you've been in the habit of doing. If you don't want to hit something, focus on the point where you want to be stopped, or toward an escape path to the side. It may sound odd, but your motorcycle tends to go wherever you are looking. That's why you're more likely to hit a pothole if you keep staring at it. If you'd rather ride over the pavement on one side of the pothole, the trick is to focus on the good pavement, not on the problem. If you stare at the rear bumper of the car ahead, that's where the bike will go. More correctly, your motorcycle goes where your nose is pointed. So, actually turn your head and look where you want the bike to go. If you'd rather avoid a collision, focus on the escape path where you want the motorcycle to go. Wouldn't it make sense to focus on the pavement in front of the car where you intend to stop short of a collision, or to the clear pavement on either side of the car?